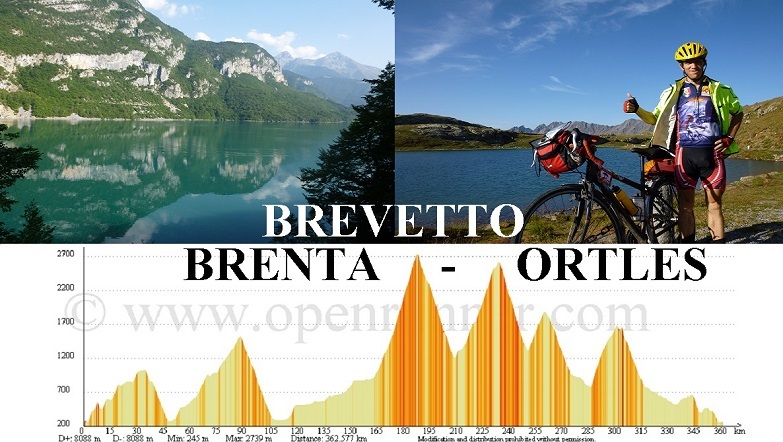 I'm proud to present my cycling video about the italian permanent brevet Brenta - Ortles (officially 363 km + 8088 m). Time to finish: 34 hours. Pietramurata - Molveno - Passo Palade (1518 m) - Merano - Passo dello Stelvio (2760 m) -landslide on the descent - Bormio - Passo di Gavia (2621 m) - Ponte di Legno - Passo del Tonale (1883 m) - Dimaro - Passo Campo Carlo Magno (1682 m) - Stenico - Pietramurata. I loved it very much and beside it was adventurous because on the Stelvio descent I had to climb through rocks because serious landslides caused by a strom. During the winter I will edit a longer, ca. 50 minutes long video too and in few weeks time I will share a ca. 2 pages long travelogue about it. I can truely suggest riding this wonderful challenge or parts of the route ! Thanks for watching and I hope (almost sure ) that you like it.